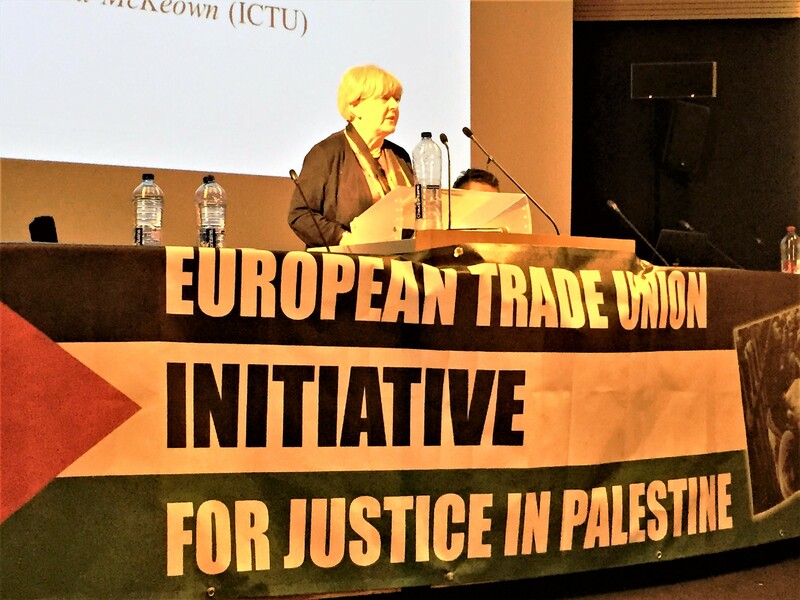 Recently over 100 trade union delegates, representing twenty nine unions and three million members from all over Europe, gathered in a historic first meeting in Brussels to challenge European governments’ complicity with Israel and establish a cross European platform in solidarity with the people of Palestine. Israel’s blatant disregard for international law is well documented. Perhaps less well known, is its co-operation agreement with the European Union providing it with access to trade and allowing more participation in EU programs and projects than any other non-European country. The European Coordination of Committees and Associations for Palestine (ECCP) has recorded that whilst the Israeli government contributed €535 million to the EU’s research programs over a 6 year period, Israeli firms and institutions actually received even more funding in return – €840 million worth. Israel is expected to benefit similarly from the new Horizon 2020 research funding program unless the repeated appeals from the international Boycott, Divestment, Sanctions (BDS) Movement are heeded. The very existence of this 16 year old Agreement is all the more remarkable given that Article 2 emphasises that it is based on a “mutual respect for human rights and democratic principles”(!) Not something one immediately associates with a state which continues to illegally occupy Palestinian land in contravention of international law and in defiance of countless statements of condemnation from international governments and organizations, including many from the EU itself. 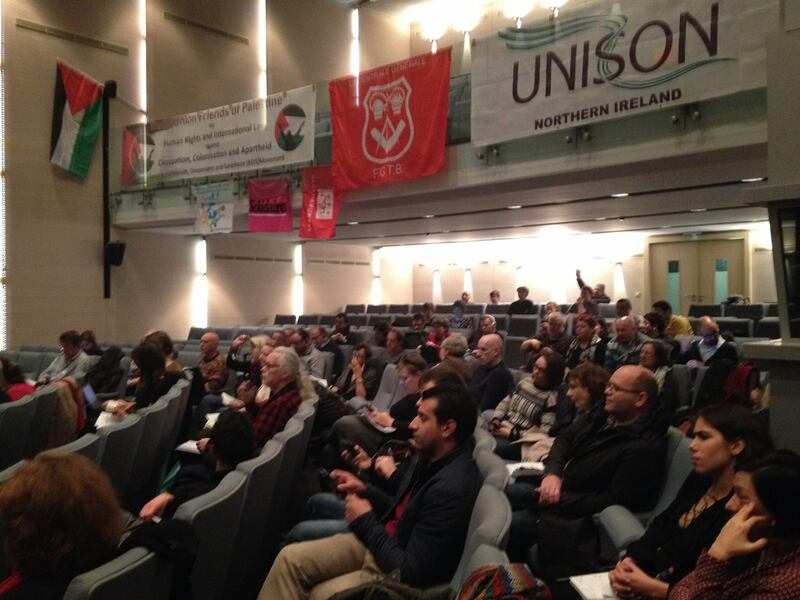 The two day long trade union gathering heard calls for an end to the occupation of Palestine and the repeal of the much criticized agreement, seen by many as a legitimization of the illegal occupation in contravention of international law and UN Conventions. 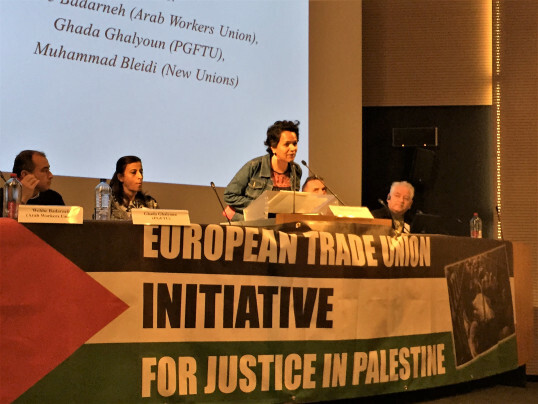 The new initiative has been taken by a cross-European group of trade union organisations intent on developing a network strengthening ties between workers organisations in Europe whilst also reaching out to all sections of the Palestinian trade union movement. Indeed the PGFTU, the Arab Workers Union and the New Unions were all active participants in the discussions. 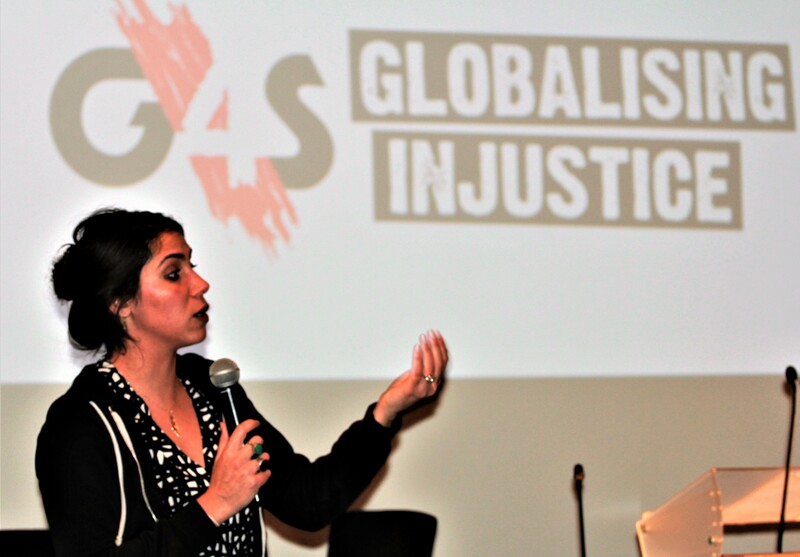 The campaign focus is on raising awareness on their respective governments’ complicity in Israeli human rights abuses and war crimes, and the culpability of corporations that support and benefit economically from the illegal occupation. The organising committee’s scathing criticism of the EU accuses it of failing to hold Israel accountable for its grave violations of international law, failing to address the illegality of the occupation of Palestine, failing to tackle the rampant discrimination against Palestinian citizens of Israel and numerous human rights abuses – including the denial of the right of Palestinian refugees to return to their homelands as adopted by the UN in resolution 194, almost a full seventy years ago. 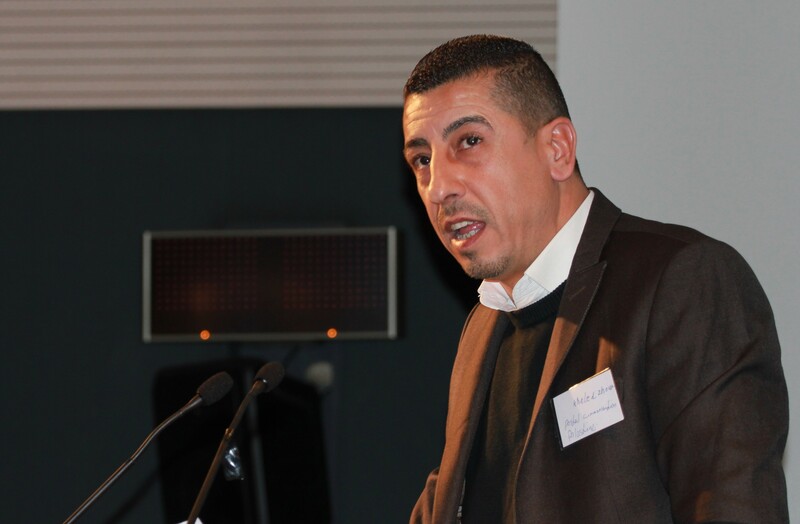 The formation of this network is a major breakthrough for solidarity work within the European trade union movement, which has been consistent in its call for a just solution for the Palestinian people. The EU has previously had no hesitation in applying various forms of sanctions against Russia when it annexed Ukrainian territory and has acted similarly towards about forty other states at various times over recent years. The shameful double standards being applied in the Israeli case are unacceptable and are interpreted by many as tacit support for Israel’s continued violations of international law. Under massive international pressure, the EU ruled in 2015 that products from the illegal Israeli settlements in the occupied West Bank, East Jerusalem and the Golan Heights, should be clearly labelled as such. This month, almost a full year later, France became the third member state, after the UK and Belgium to enforce the decision. Ironically, the original ruling led to the Netanyahu government threatening to boycott co-operation with the EU whilst The Independent reported an Israeli minister calling the decision “disguised anti-Semitism” – the usual red herring reserved for censoring open debate on Israel’s brutal occupation policies. The same news report refers to European diplomats admitting “in private that the strength of the Israeli response made many member states wary of issuing their own specific guidelines.” The Israeli propaganda machines concerted efforts to stamp anything and anyone critical of their government policies as antisemites is clearly bearing fruit in some circles. Indeed, one of the issues raised at the Brussels meeting was the need to effectively challenge the misleading campaign by the Israeli government to redefine antisemitism to suit its own distorted political agenda. However, the French government has now joined the ranke og major European nations that have broken through that self-imposed barrier and the remaining European governments should immediately follow suit. The European trade union movement will be doing their utmost to ensure that this happens sooner rather than later. The global BDS movement has been under increasing attack from the Israeli propaganda machine in the last year and yet 2016 has heralded a series of major victories for human rights in Palestine. Prominent multinational companies such as Orange, CRH and G4S have followed Veolia’s lead in withdrawing their business from projects that infringe on Palestinian rights. Also this year, an increasing number of European municipalities or city councils in countries as diverse as Norway, Spain and Ireland have declared their opposition to the Israeli occupation whilst major churches in the US have been divesting from Israeli banks and international companies who support the occupation. The BDS Movement is expanding and its round up for 2016 points to major successes for the right to boycott Israel in support of Palestinian rights under international law from the European Union, the governments of Sweden, Netherlands and Ireland, as well as from Amnesty International, the American Civil Liberties Union and the International Federation of Human Rights, as well as “hundreds of political parties, trade unions and social movements across the globe”. Another major victory came in March of this year when the UN Human Rights Council, voted to create a database of Israeli and international corporations that are complicit in and profiting from Israel’s occupation – a development that will expose even further business interests who are complicit in Israel’s numerous and continuous violations of international law. 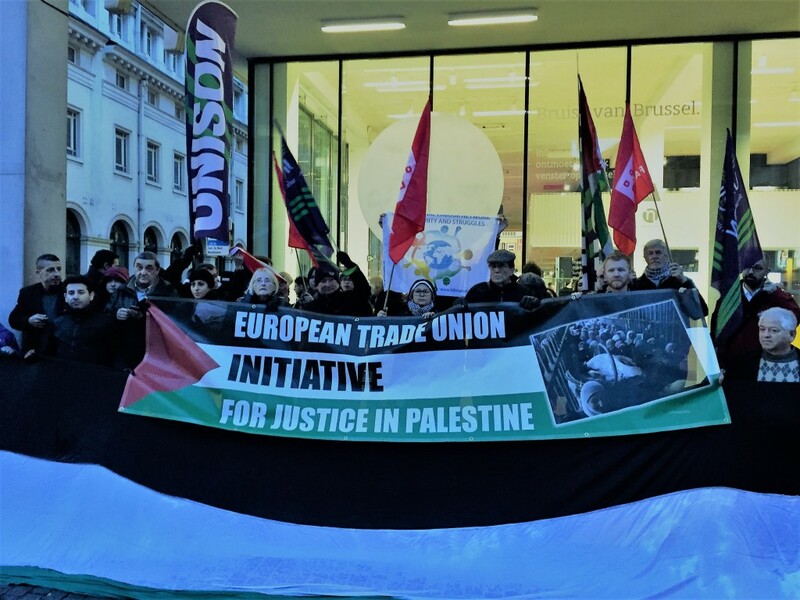 This latest coordinated trade union mobilisation in Brussels in support of the Palestinian people is certain to exert even more pressure on European governments to fulfil their moral and legal duty to ensure an end to Israel’s illegal occupation and the denial of Palestinian rights. 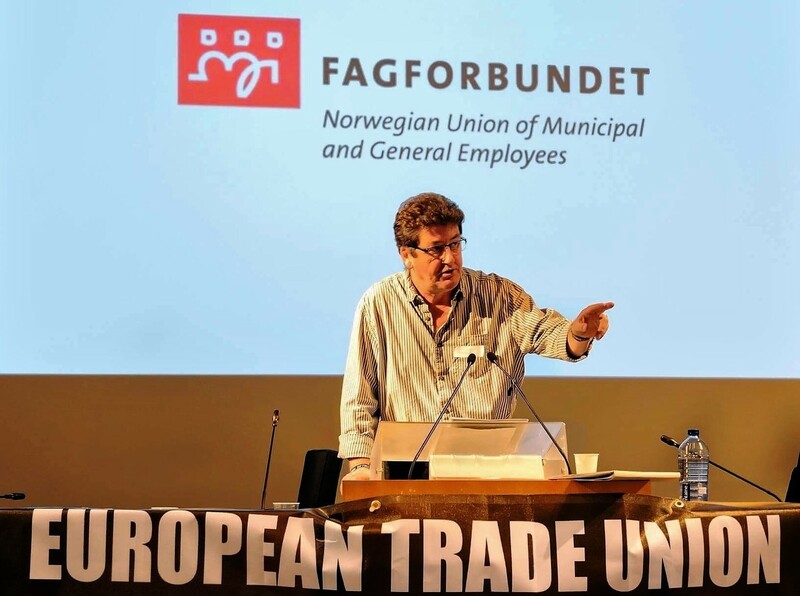 The Irish Congress of Trade Unions (ICTU), Fagforbundet (Norway), Union Syndicale Solidaires (France), La Centrale Générale-FGTB (Belgium), ACV/CSC Brussels (Belgium), UNISON (UK), The Norwegian Trade Union Federation LO in Trondheim, (Norway) Unison N. Ireland Region (Ireland), Derry Trades Union Council (Ireland), Belfast&District Trades Union Council (Ireland), Workmates – trade union section of Norwegian Palestine Committee (Norway), Trade Union Friends of Palestine (Ireland), Communications Workers Union (Ireland), Confederacion Intersindical Galega (Spain), Mandate Trade Union (Ireland), ELA – Basque Workers Solidarity (Euskadi), IRW-CGSP (Belgium), LBC-NVK (Belgium), Palestinawerkgroep-FNV (The Netherlands), CNE (Belgium), IAC (Spain), Civil Public and Services Union – CPSU (Ireland), Intersindical Valenciana (Spain), Irish National Teachers’ Organisation – Branches: Derry City, Newry, Dungannon, Armagh, Belfast West (Ireland), The Palestine Committee of Norway, Union section (Union of railway workers), IMPACT (Ireland), CGT France – 66, The Northern Ireland Public Service Alliance (NIPSA). Hundreds Protest Against The Visit Of Benyamin Netanyahu In Brussels. The “IHRA Working Definition of Antisemitism”. Fact-sheet and Recommendations issued by ECCP and Free Speech on Israel. 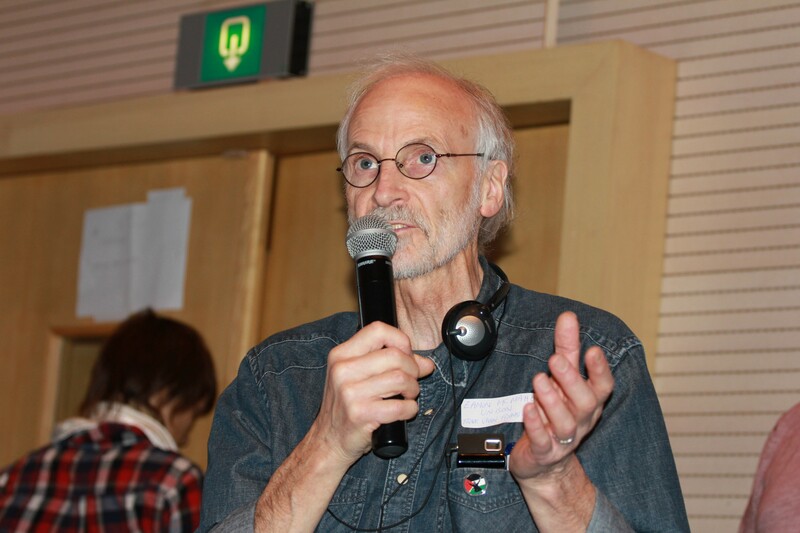 Six Reasons why No One should adopt the so-called “EUMC” or IHRA Working Definition of Antisemitism. The definition of anti-Semitism by the European Monitoring Centre on Racism and Xenophobia (EUMC): Towards a criminalisation of criticism of Israeli policy?. VIDEO: FLYSEC PROJECT - EU FUNDING TO ELBIT. Israel’s participation in Horizon 2020: aiding and assisting Israeli violations of international law. Israeli participants in Horizon 2020. Dual use and misuse of research results in the case of EU funding to Israeli military and security companies. Fact Sheet: Dual use technology – how Europe funds Israeli military companies trough Horizon 2020. FLYSEC - new EU Funding To Elbit – Securing Apartheid In Palestine And Beyond. European License For Israeli Torture: The EU-Israel LAW TRAIN Joint Project. FACTSHEET about the EU-Israel Association Agreement. Will Europe address Israeli Colonialism and Apartheid? The Case of Palestinian Jerusalem. 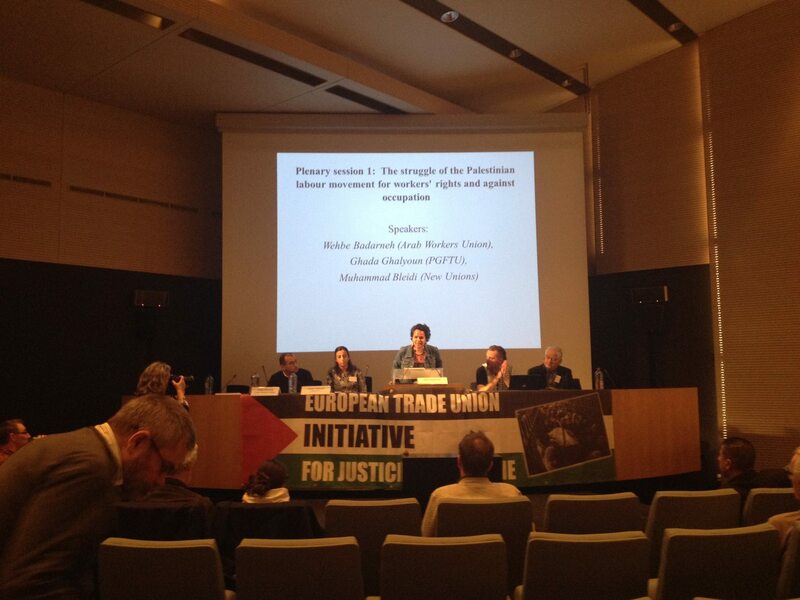 Copyright European Coordination of Committees and Associations for Palestine. All Rights Reserved.